Taking stock of the tidal wave of think pieces that has swept the internet since the release of Hannah Gadsby's Nanette, it's a bit puzzling that Chris Gethard's 2017 HBO special, Career Suicide, hasn't been referenced more frequently. Admittedly, it doesn't slot perfectly into the debate Gadsby has inspired, but in a tedious conversation about how uproarious a show needs to be in order to be considered "standup," Gethard's absence from these discussions is, at the very least, an indictment of the short-term nature of our collective memory. As a performer whose material has historically ranged from deeply absurd (The Chris Gethard Show) and strikingly reflective (Career Suicide) — and occasionally both at the same time — there is perhaps no one better positioned to comment on this ongoing debate than Gethard. And, although he wants to be clear that he loves Nanette, he also wants to remind audiences that we shouldn't lose sight of the potential utility of comedy when discussing it's inherent limitations. "One of the really beautiful things about comedy is that jokes are the sugar that helps the medicine go down. And I'm really a firm believer in that. If you can make a joke funny enough, someone will listen to something that they're usually averse to listening to, or someone will hear an opinion that they disagree with. That is an extremely powerful thing about jokes." 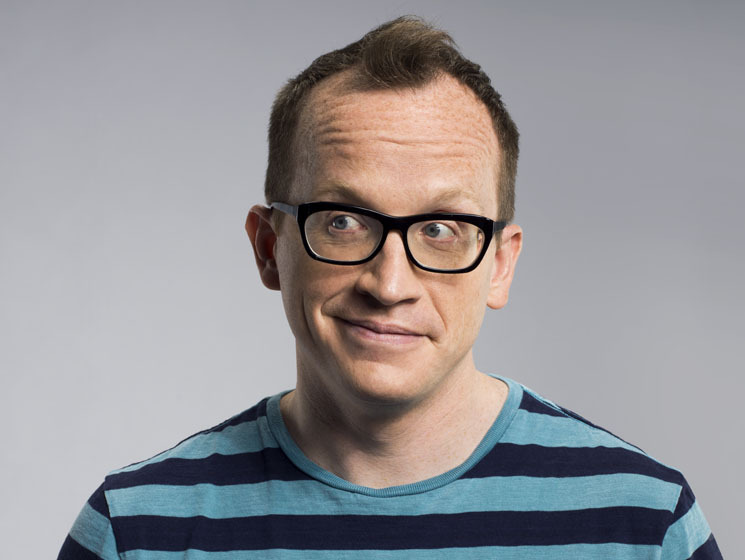 Coming off the back of Career Suicide, a show where he was actively instructed to cut jokes in service of the greater narrative, Gethard has refocused his energy on pure standup more recently, seeking to remind people that "there's a reason I've been working in comedy for 18 years, and it's not because I'm always the sad guy." Still, he can't divest from his impulse to probe more meaningful themes entirely, indicating that his newer material, while "very aggressively funny" also takes a wider look at how "the internet has allowed us to craft personas and not let other opinions in" and also "this idea that the world can be perfect, which I really don't agree with." This desire to be a little more thoughtful on stage is something that has followed Gethard around his entire career, but it has perhaps been strengthened recently by his experience working on his podcast, Beautiful Stories From Anonymous People. A weekly show in which Gethard speaks to a completely anonymous stranger for an hour at a time, the podcast is less of a traditional comedy project than it is a truly fascinating social experiment that illuminates the nature of connection in modern society, often eliciting the full range of human emotions within the span of a single episode. "I do really think that it has helped my comedy immensely in the sense that, every single week, I get to have conversations with people where they let their guards and sort of let me know where their heads are at, where their hearts are at, and what they're thinking," he says. "And, one of the broad ways to define standup, I think, involves understanding the psychology of the people you're talking to, you know? Understanding what types of things push people's buttons, how to stay a step ahead of their reactions, and how to have an innate sense of what they might be thinking so that you can either play into that or play against that." On the topic of whether doing this podcast has opened him up more to the idea of engaging strangers in conversation in public settings, however, Gethard clarifies, "I'm actually an extraordinarily shy person. People say 'I saw Career Suicide, let me tell you about the darkest thing I've ever been through.' It's kind of a lot to take on. I have trouble wrapping my head around the fact that my career has turned into this, because it's not really who I am in my bones." Ironically, whether this is something that Gethard's sizable, yet tight-knit community of fans understand about him, it is likely the reason they gravitate to him so strongly in the first place. Only a person as introspective as Gethard could mine his soul as effectively as he has to craft a body of work that has resonated so deeply with so many. Chris Gethard is performing at the JFL42 Festival in Toronto from September 27 to September 29; find tickets here.